We had royal treatment from the brothers Nick and Ifrem Kafieris. We felt like we were special guests in their home. Excellent location and views to the caldera. The best place in Santorini to stay. Loved the in room breakfast. Excellent service from the brothers Kagieris. Extremely hsppy and will return for sure. The property is at very prime location. We have bus stop near so that we can travel to different places. The view is very beautiful from balcony rooms. Rooms are very clean and decorated. Fantastic breakfast is given in morning....!!! Staff was very nice and enthusiastic. Nice location with a nice view from the common terrace. Not so crazy view from the little balconies. Apart from this I don't think it was worth so much money for that time of the year. We were pretty happy with the amenities. We went during the off season and hence public transportation was one issue. But we still managed to cover some the places by walking. There is a slight uphill climb to the place from the main road but it was manageable We loved the view , the serenity and the staff. A treat in terms of the peace and quietness just to enjoy the place . The staff was very enthusiastic and helpful !! Loved the location!! Beautiful view of the sunset and wonderful breakfast!! Location was excellent. Staff were lovely! Breakfast in the room option was excellent. The view is good but then Santorini is great. Reception is excellent. Very helpful. Things are safe and sound here. Probably the best view on the island. Quiet, clean and relaxing. Right on the cliff, steps from the town but away from the noise. Amazing sunsets from the room balcony. Nice breakfast included and brought to you each morning at your preferred time. Super nice staff. Lock in a great price for Kafieris Apartments - on the Cliff – rated 8.3 by recent guests! One of our best sellers in Firostefani! Located on the highest point of Fira, 1,650 feet from the center, Kafieris Apartments features views of the sea and the caldera. At the end of the day, guests can relax in the rooftop pool, enjoying the scenic view. 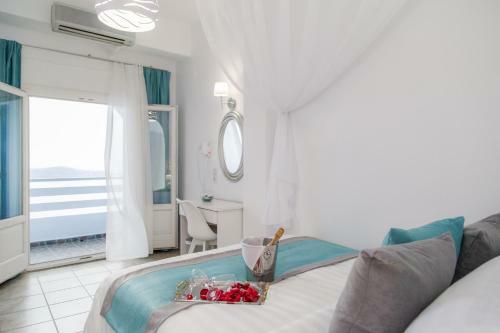 Guests can experience a true Santorini holiday by staying in a traditional Cycladic-style room. The rooms feature plenty of amenities for comfort. Guests can also enjoy incredible views of the island, the sea and the magnificent caldera from the privacy of their own balcony. Guests are invited to start the day with a complimentary breakfast, before exploring this beautiful island. Kafieris Apartments are well-serviced by public transport. 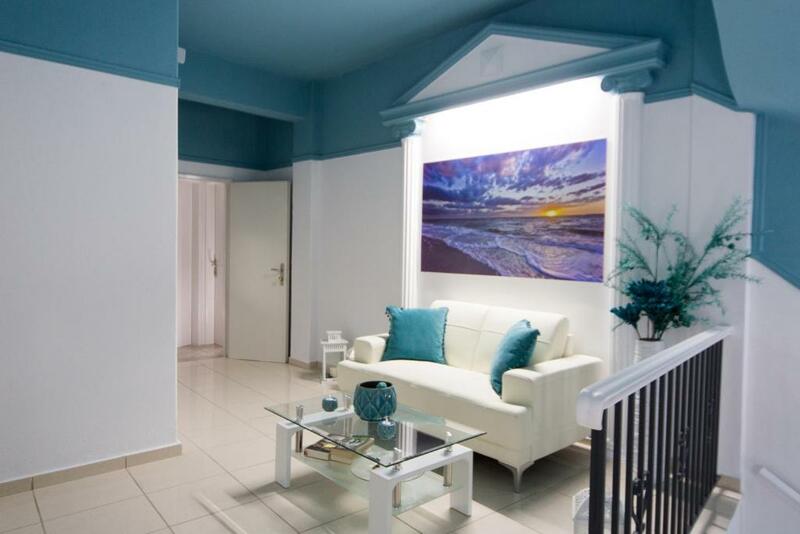 They are also within a short walking distance of all that Fira has to offer, including Nomikos Conference Center, which is just 150 feet away. This is our guests' favorite part of Firostefani, according to independent reviews. 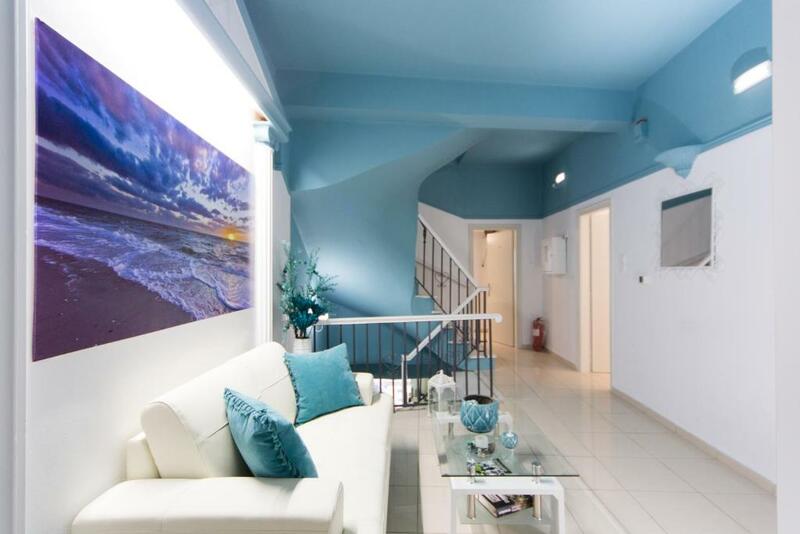 뀐 Located in the top-rated area in Firostefani, this property has an excellent location score of 8.9! When would you like to stay at Kafieris Apartments - on the Cliff? This room offers a balcony with a view to the caldera, sea and the volcano. Please note that units are assigned upon arrival. This room offers a balcony with unobstructed or side sea views. This room features a satellite TV and air conditioning. Kindly note that this unit does not offer view. 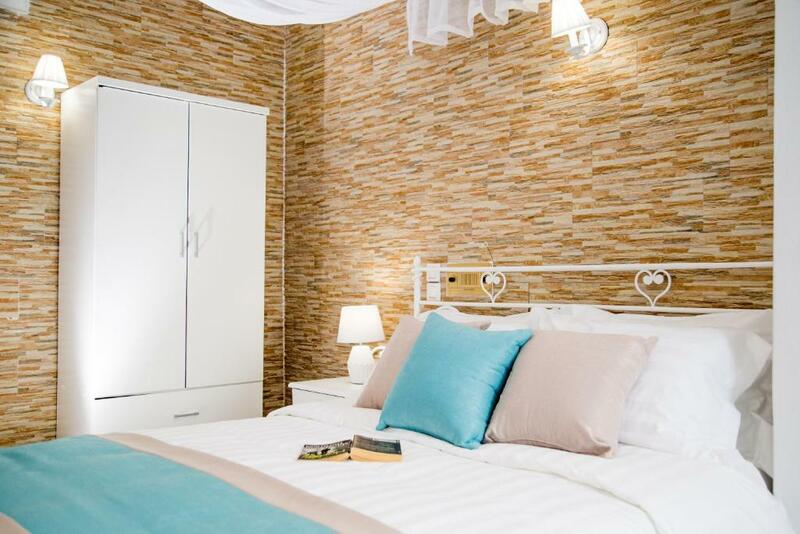 This double room has a soundproofing, tile/marble floor and electric kettle. This triple room features a balcony, electric kettle and air conditioning. House Rules Kafieris Apartments - on the Cliff takes special requests – add in the next step! Kafieris Apartments - on the Cliff accepts these cards and reserves the right to temporarily hold an amount prior to arrival. Please note that the reception is open from 07:30 until 20:00. Please inform Kafieris Apartments - on the Cliff of your expected arrival time in advance. You can use the Special Requests box when booking, or contact the property directly using the contact details in your confirmation. Our room and especially the bathroom was too small and tight. Breakfast was nice, great location, breathtaking view on the Kaldera, hospitality and care is perfect, Pavlos is a fantastic person, thank You!! just bed could have been bit more comfortable. everything was perfect. very good locations. superb balcony view and sunset were stunning. restaurant near by. 10-15 min walk to Fira. friendly staff. bus stop just outside that can take you to Oia or to Fira main bus stop. Fira bus stop is 10-15 min walk. Moved our room while doing work to the whole place couldn’t even help us do that or confirm a time to move. No water on the second day to shower. In room and bathroom facilities horrible Did not even offer a discount for the upheaval, noise or discomfort I would not recommend this place to anyone! Not much to mention that was good! Except for the in room delivery of breakfast only the first 2 days didn’t even bother to offer on the third day ! Couldn't find people at the reception when we needed them. Heater didn't work well. Breakfast was very good. Amazing view from the roof. Very clean - clean too every day. This property was not ready for winter season. Bathroom was too small and the shower was not working. We could not report problems to anyone because we did not find anyone in the reception in the property. Location. They provided good Airport transfer on time. They should improve the cleaning of bathrooms, we stay a week, so we notice when some days seems that they only change the towels. Great breakfast , very good location and amazing view if you have the rooms with this caldera view and you should go to the terrace at sunset if you don't have view from your room. A short walk to grocery store but delivery is a good option, Tabasco restaurant was efficient even on new year's eve at 10 pm! Nice walk to fira in less than 15 minutes . First we booked the airport transfer and confirmed thru email. However no one pick us up from airport. We asked the staff but the staff can't speak English. No heater in the room make it very cool in winter. All facilities in hotel close in winter. Hotel lock the main door at night and no one man the desk end out we being locked outside with cool weather. Finally got hotel guest hear us and open the door for us. This is the worst hotel in this Europe Trip. View from hotel is good. But in winter the wind is too strong and cool, can't enjoy the view at all. Everything from convenience of location to facilities to breakfast was excellent. In fact I will go again and stay at the same place. You can see both sunrise and sunset from the rooftop.